The series "Bears at Work" is created and publsihed by Ellen Maurer stroh. This Bears at work pattern, "The Stitcher" displays a bear dressed in a blue dress. 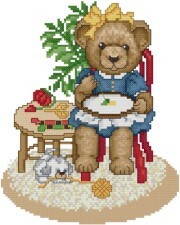 The bear is sitting on a chair while stitching. With Supplies: $33.86 You download the design. We will send you, 32 skeins of DMC Floss & Wichelt 14ct. 18" x 21" Aida (Ivory) to complete your project.